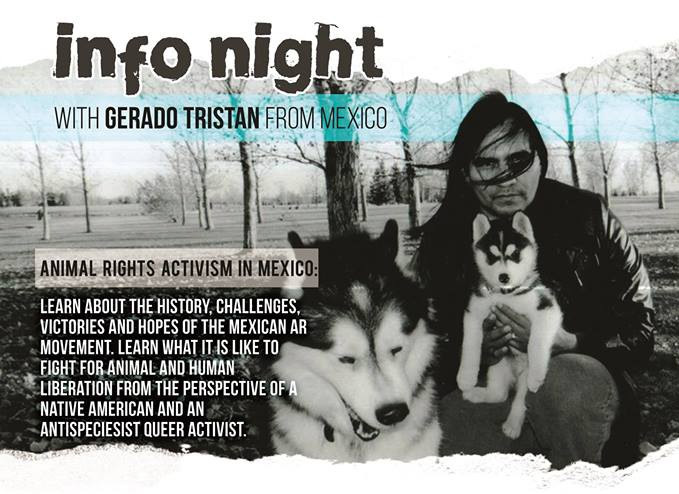 Next To Nowhere and Merseyside Animal Rights are very excited to be hosting Gerardo Tristan, anti-speciesist and queer activist from Mexico, on Wednesday 19th September in Next To Nowhere, 96 Bold Street (ring the white bell for access), he’ll be speaking from 7pm with food beforehand. Learn about the history, challenges, victories and hopes of the Mexican animal rights movement. Learn what it is like to fight for animal and human liberation from the perspective of a Native American and an anti-speciesist queer activist. Gerardo Tristan/Wotko is a Nahuatl, anti-speciesist and queer activist and community organizer from Monterrey, Mexico with over 30 years of experience working on a wide range of social issue such as indigenous/lgbtq /animal rights and food justice. From working as a coordinator of an international students group volunteering in the mountains of central Mexico helping indigenous coffee cooperatives in the summer of 2002 to being a collaborator at the Zapatista’s (EZLN) peace talk process during the spring of 1994, Gerardo has always been involved in vital issues in his country. In the fall of 2015 Gerardo founded FaunAccion, in CDMX. The group’s mission is to empower activists and agents of change by providing them with education and relevant tools for their activism. Currently Currently Gerardo is working on two food justice projects: El Molcajete, a food education program on wheels in Mexico and The Chestnut Tree Reclamation Project in TN, USA. Please help us spread the word! We very much hope you can make it.